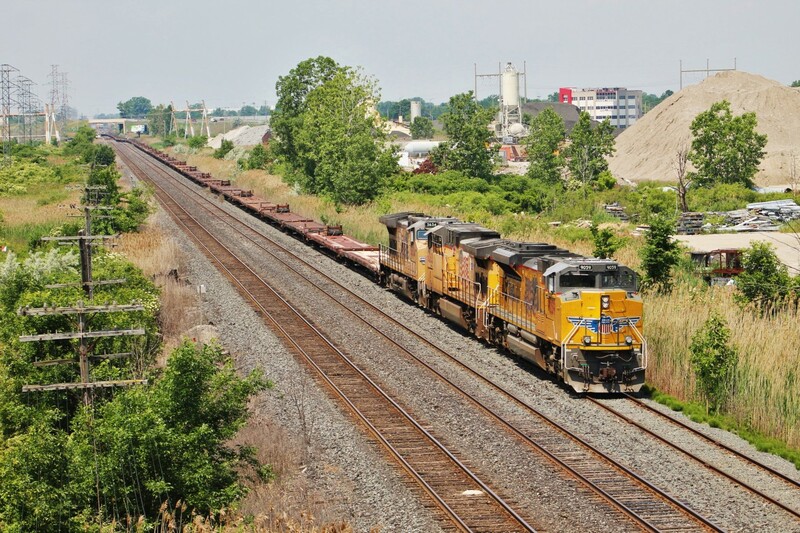 Railpictures.ca - Mike Molnar Photo: An empty wind turbine train takes the back track between Jefferson and the Begin/end CTC signal 1045 to meet CP 235 who was going into Walkerville Yard to make a set off. Usually, American power like this gets swapped with a leader that has a hot plate or a microwave but on this rare occasion they kept the original leader. | Railpictures.ca – Canadian Railway Photography – photographie ferroviaire Canadienne. Caption: An empty wind turbine train takes the back track between Jefferson and the Begin/end CTC signal 1045 to meet CP 235 who was going into Walkerville Yard to make a set off. Usually, American power like this gets swapped with a leader that has a hot plate or a microwave but on this rare occasion they kept the original leader. Solid UP consist! Great catch Mike!